I haven’t spent any time covering this but have recently taken some time to review all of the testimony about the van sightings and I thought it may be helpful to spend some time summarizing all of the different descriptions as well as the time and dates provided by each witness. 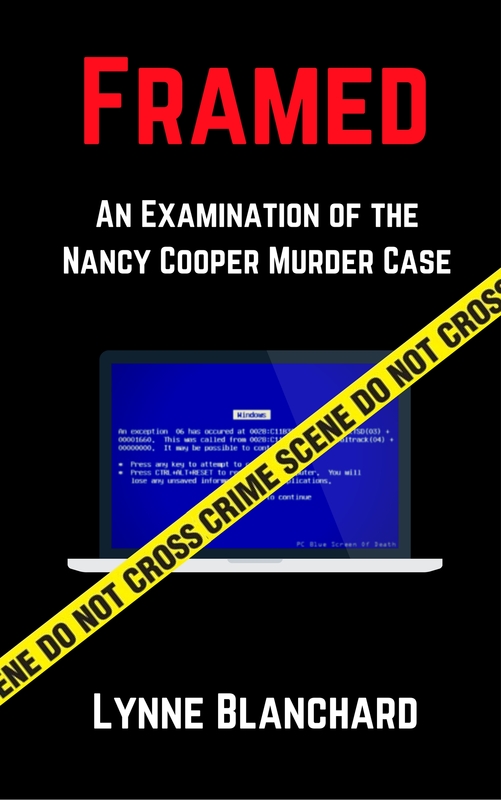 There were four witnesses who reported seeing a white, maroon or reddish-white van in the days surrounding Nancy’s disappearance. Though the descriptions aren’t exactly the same, that is typical for witnesses to have slightly different recollections because at the time they don’t realize that the information is going to be important. Imagine if four witnesses came forward and said they saw a white car near Fielding Drive around the time of the murder. It wouldn’t matter if the descriptions were slightly different to prosecutors because Brad had a white car and since that information fit with their theory that he was responsible for the murder, they would do everything possible to stress the significance of the sightings. Since the van didn’t work for them, it was downplayed — “witnesses described the van with different colors, it may have been a work van.”, etc. During the trial I was struck by the amount of detail some of the witnesses described and wondered why police didn’t issue an all points bulletin requesting information from the public to contact them if they saw a white/maroon van driven by a Hispanic male. Two witnesses described seeing two Hispanic males with the van. The van appeared to follow a female jogger matching Nancy’s description and the next day the same van is spotted on Fielding Drive where the body would later be found and no one from the police believed this was important?! Police had Curtis Hodges’ description before Nancy’s body was found. They didn’t bother to pursue this lead though because they believed they had the case solved already, and they didn’t share the information with the media so that others would be on the lookout for a van matching this description. They remained silent. Maybe the van looked something like this. Perhaps this is why some witnesses described it as white; others as maroon/reddish-white. 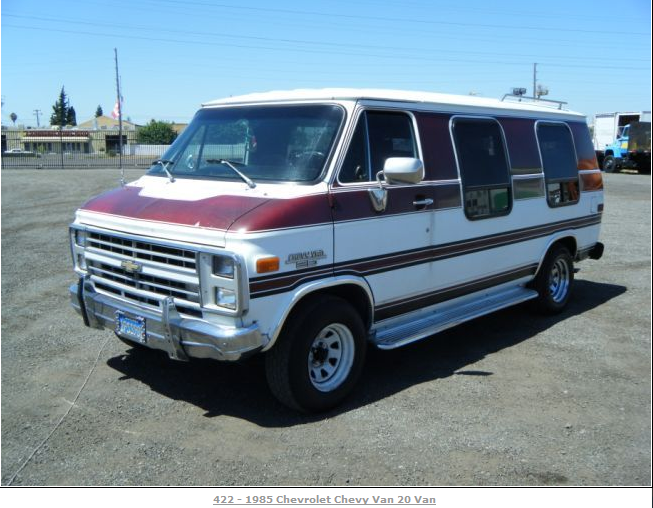 There are several two-tone vans from the 80’s that match Curtis’s description. Also, the two witnesses who described it as “white” saw it in the dark and it’s possible that the red wasn’t visible in the dark. 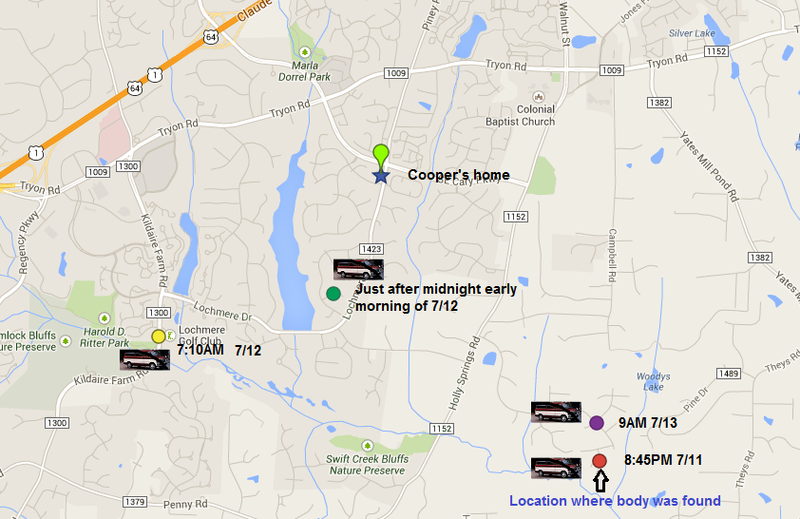 Here’s a chart of the witness’s descriptions matched up with a map marking the locations of the sightings. 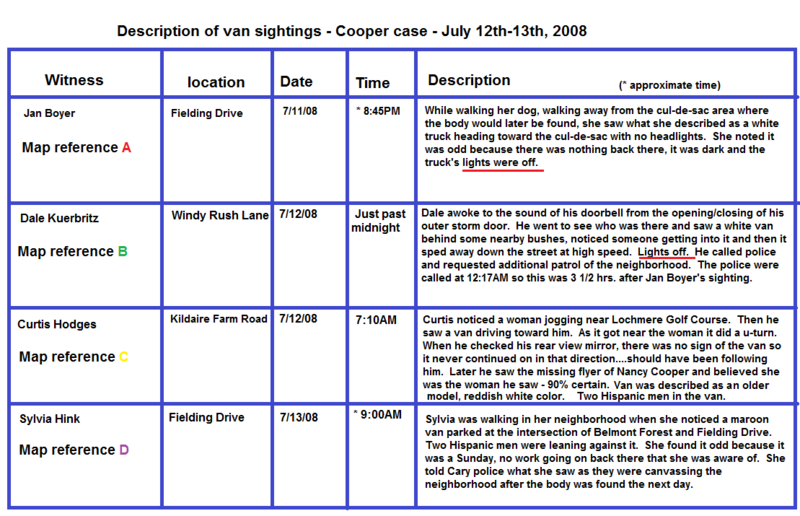 The van sightings began on the evening of July 11, 2008 and continued the next day, July 12th and again on the 13th. After that, no more sightings were reported. I believe it must be related to her disappearance – must be involved in the murder. Two of the witnesses noted that the van/truck was driving without headlights. One of the sightings occurred on 7/11 and I believe it could have been the murderer scoping out a location to dump the body. Another witness saw a maroon van with two Hispanic men the day after Nancy disappeared on Fielding Drive. It didn’t belong there. It was a Sunday, no work was going on and they were just standing there, leaning against it. It’s very odd. Again, combine all of the sightings and this is certainly information that police should have had the media share with the public. The tire tracks led right up to the body. Police compared the measurement inside the tire tracks to those of the Cooper vehicles and they did not match. Could the wheel base match up to an older van? Would be cool to find such a van and actually take a measurement. Yes, well it would have been a good idea at the time. The case is very cold now. It’s a cold case, but it would help to make the point stronger that Nancy’s body was likely dumped out of some van, possibly even providing a make and model. DMV records exist, so officers could do something — even if cold. Sadly, they took note of the wheelbase, but still argued that it was Brad who drove there in the middle of the night, not leaving a single track behind. If only. I would love if they would reopen the investigation. My Uncle had a chevy/gmc van when i was child. The van was white in color, but had a bold dark blue, horizontal stripe, about 10″ high that basically circled the van. He was always puzzled when folks would say, “I like your blue and white van”. 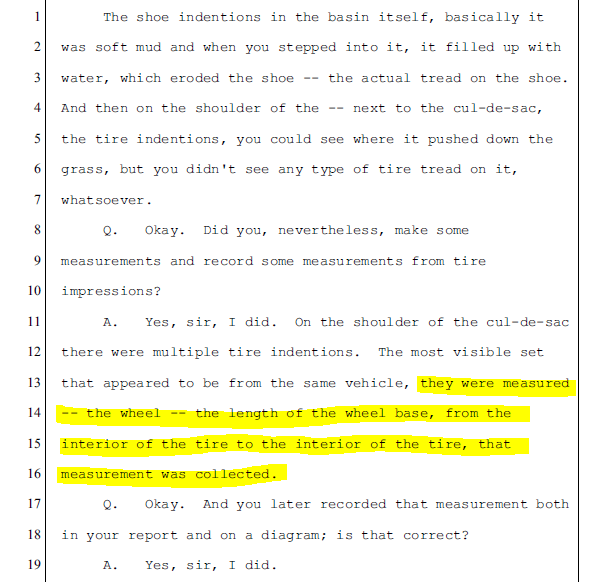 Maybe a minor point but the CCBI report refers to the 3′ 11″ as the vehicle “wheel base”. As a professional investigational agency I feel that evidence reports should utilize the correct terminology in the descriptions. A vehicles “wheel base” is defined as the measurement between the center of the front wheel to the center of the rear wheel. The measurement between the center of a vehicles two front wheels and/or the center of the two rear wheels is defined as “track width”. Maybe just another example of a sloppy investigation! Yes, I’m not sure why they called it “wheel base”. I just measured my compact sedan. The distance mid-tire to mid-tire is 5′ 2″. I can’t imagine any vehicle, let alone a van, with only 3′ 11′ between wheels. Did I measure wrong? You should be able to search for the dimensions for your particular vehicle to see if it’s close to what you got. At 47″, I don’t think we’re looking for a car. That’s the interior measurement, inside the cargo area. It’s width at wheel housings. This article describes what wheel base is supposed to be. Does this document refer to a system that an investigator may use to ascertain a potential list of vehicles that may fit a specific technical criteria? If so, is it possible that CCBI may have used information obtained from the search area to attempt to obtain a potential list of match vehicles? If that were the case, maybe it’s a case of garbage in, garbage out! If you enter a search criteria for a “wheel base” of 3′ 11″ maybe you get a no match result. If it a ” wheel track” measurement that should have been entered…..maybe a different result. I’m not sure how one would measure the wheelbase (the “real” wheelbase) without having the vehicle in hand. Measuring the track width is certainly easy to do. Track width of a golf cart is 38.5″. Se we’re looking for something 8.5″ bigger than a golf cart. Thanks, everyone for the comments about the measurements. The post has been edited to reflect the fact that I am again puzzled about the short measurement of 3’11”. However, the fact remains that a van was seen 4 times that we know of (and possibly more that wasn’t reported) in the area in the days surrounding Nancy’s disappearance. I will try to find out more about how they arrived at 3’11” and will update the post again if I do. 3′ 11″ is most definitely narrow for a car/van track width. 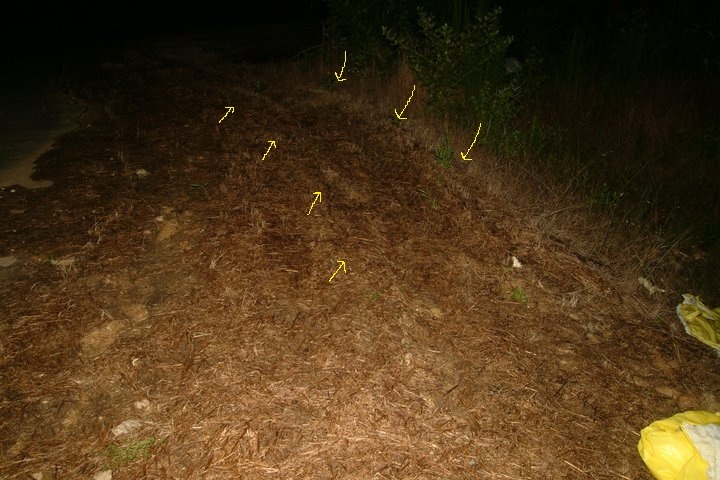 Another possibility is that these tracks are from two separate passes over that area with one side of the vehicle on the pavement and another on the dirt. 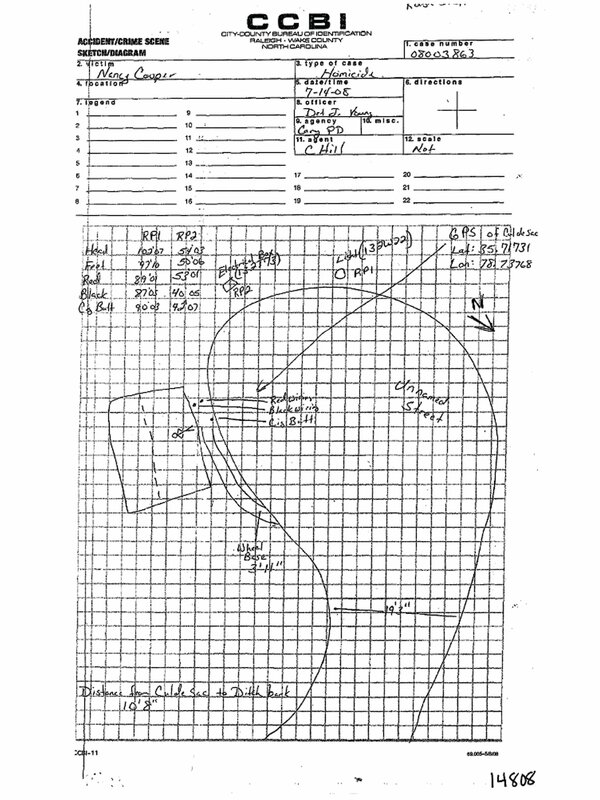 One can’t tell from the sketch if the tracks are true parallel or if there is some deviation in the width between the tracks. If the tracks were made in two different passes that might explain why they are only 3′ 11″. More detail photos would need to be reviewed. Yes. I’m going to review the CCBI agent’s testimony again to see if this was discussed in more detail. Update: Please read the post again. 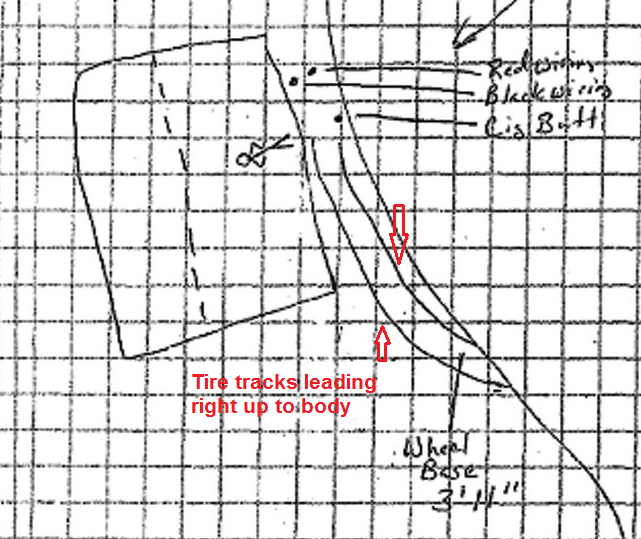 I found the testimony about how the tracks were measured. Agent Hill measured from the inside of the tire to the inside of the other one. That explains why the number is so low. Now, can we determine the type of vehicle based on that? I wish there were more measurements to include outside tire widths. I wonder about that too. It’s too bad it wasn’t properly investigated. We may have been able to determine the identity of the van owner, had the van searched and discovered if they had any connection to anyone in the circle of “friends”.